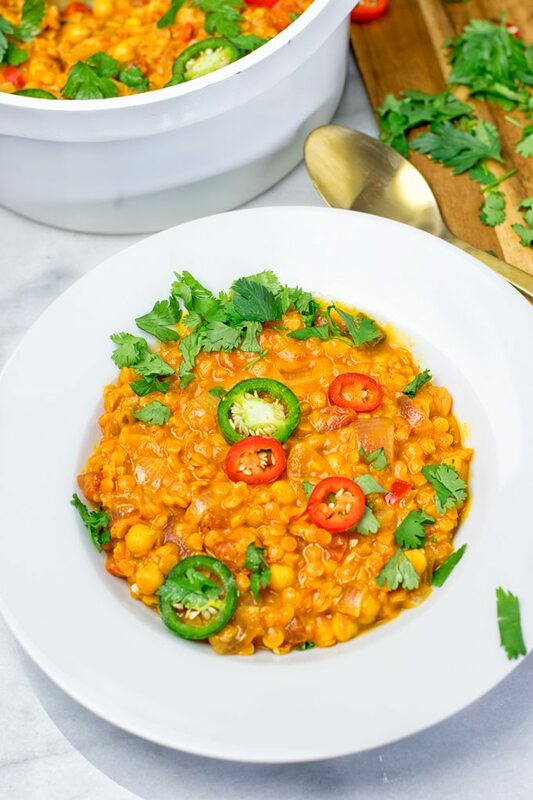 This Moroccan Chickpea Lentil Soup is also know as Harira Soup and is full of incredible flavors. 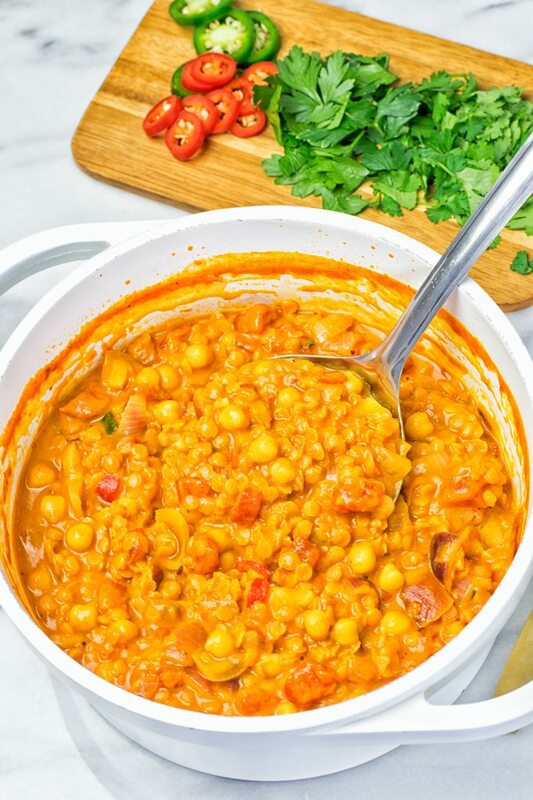 You will be thrilled by this one pot meal which is naturally vegan and gluten free. You know me, I’m all about simple and delicious meals. I’m not a guy who loves to spend hours and hours in the kitchen or to buy complicated ingredients. So no wonder I’m also a big advocate of one pot meals. Some of those I bet you have seen already. 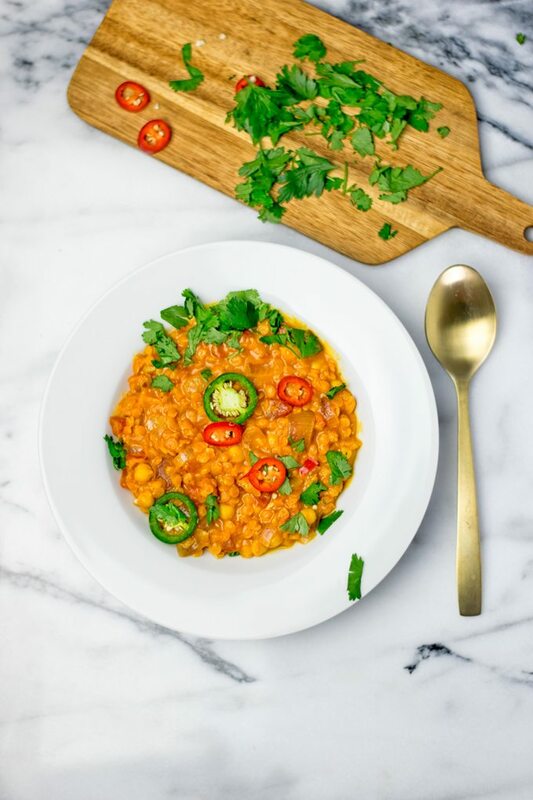 Like my One Pot Garlic Butter Lentils, the One Pot Garlic Butter Chickpeas (yes, I love the garlic butter flavor made with cacao butter), or the One Pot Red Lentil Dal. 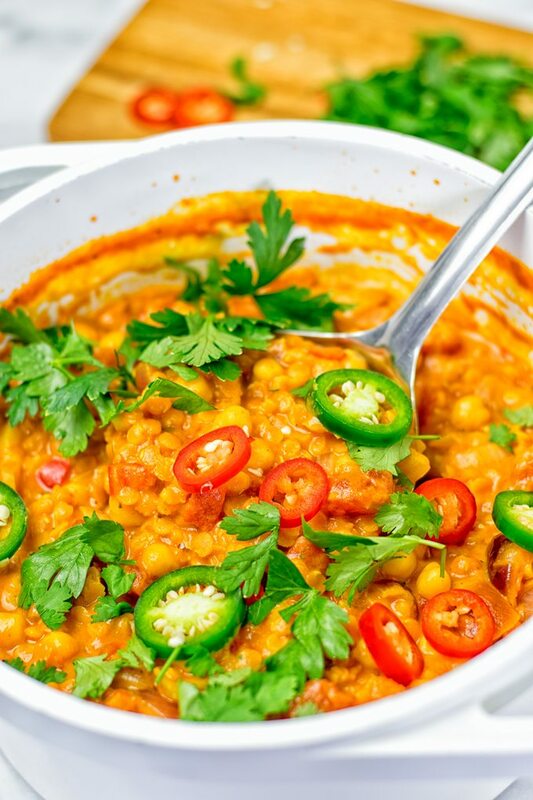 This Moroccan Chickpea Lentil Soup (Harira) is no exception. You can throw all ingredients together in one pot, no need for more bowls. Plus it’s tastes insanely delicious and is just packed with incredible flavors. I can happily confirm it’s one of my new favorites. I made this several days for myself and friends so you can feel my fondness. This recipe is inspired by a traditional Harira Soup from Morocco. Before I became vegan, I often ate it in a restaurant only 5 blocks from where I lived. Boy, I loved it so much, I sometimes ordered a second portion. But of course, that soup is not vegan. It’s often made with meat, sour cream, and beef or lamb broth. So a no-go like this now. Recently I decided it was high time to create a plant-based version of this one of my favorites from pre-vegan days. I seriously missed the flavors. 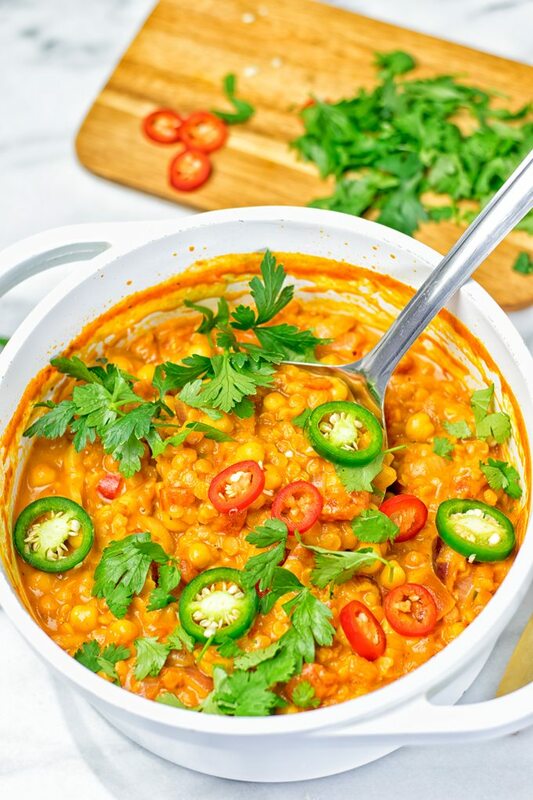 I hope you’re ready for this one pot wonder Moroccan Chickpea Lentil Soup. It’s super easy, everyone can do and make this. 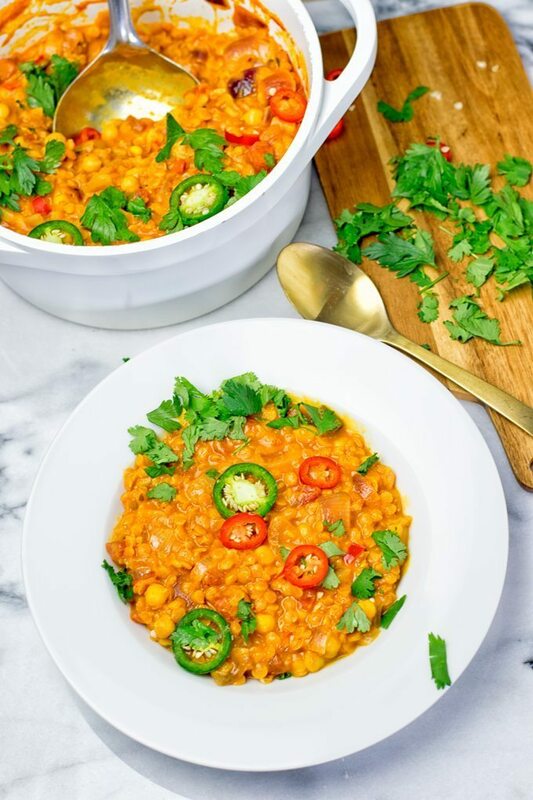 It’s hearty, satisfying, customizable, full of protein thanks to double power of lentils and chickpeas, and worthy to eat it everyday. I could tell you a lot about how we can do and make, but hey it’s so pretty easy. You will wonder why you did not make it before? No worries, I’ll show you how. The basic version only requires 6 simple ingredients. But if you love it a bit more fancy, you can customize your soup by adding optional extras like coconut milk, pepperoni or jalapeño for an amazing spicy kick. Herbs and turmeric to add a little pinch more color and bold flavor to it. Or a bit more broth to make the soup more liquid. OK, now we really get going. As I said, all you need is one single pot. Grab it and let’s head over to the stove. First heat a bit of coconut oil (or for oil free cooking just a bit of vegetable broth) and fry the garlic, onion and the optional chili or jalapeño slices if using for 5 minutes until lightly golden browned. Then add lentils, vegetable broth, chopped tomatoes, and optional coconut milk. Cook for about ten minutes. Finally add cooked or canned chickpeas to this pot and cook for around 5 minutes more. Check if the lentils are done. Serve with optional toppings to your liking, divide into bowls or eat straight from the pot. You will have a hard time for waiting for bowls. I’m happy to say the result turned out so amazing that I just had to post it here. It wasn’t planned from the beginning, I only created this out of curiosity. But as I mentioned I made it several days since then. Oh boy, that’s a sign it must be good. Even my non vegan friends devoured that in no time. Yup and they aren’t really into plant based eating. It makes an easy time saving weeknight dinner, lunch or even appetizer that you can serve even your pickiest meat lovers, like I did. You can also make a double batch or more to enjoy the whole week. The flavors will come out more and more. So meal preparing isn’t complicated with that and always fun. Also a great idea for date night. Look at that beautiful color. You know the saying “feed your eyes”. Yes it’s true and real, I mean what could be better than a colorful plate like this? But seriously the best thing is even if you aren’t into cooking, you can put everything in the pot and let it do the work. Best selling point: your sweetheart, loved one or date, all will surely be impressed. So it’s a win-win recipe, friends. If you try this for yourself, give me a tag on Facebook or Instagram, snap a picture and let me know. Cheers and happy cooking, Florian. Heat a bit of coconut oil (or for oil free cooking just a bit of vegetable broth) and fry the garlic, onion and the optional chili or jalapeño slices if using (optional) for 5 minutes until lightly golden browned. Then add lentils, vegetable broth, chopped tomatoes, and optional coconut milk. Cook for about ten minutes. Add cooked or canned chickpeas to this pot and cook for around 5 minutes more. Check if the lentils are done. Serve with optional toppings to your liking, divide into bowls or eat straight from the pot. You will have a hard time for waiting for bowls. Thanks so much for your amazing feedback and making it, Shelbi! Glad it was such a big hit! I hope you’ll find lots of more recipes to try! Hi Kim! Thanks for making it! One of my favorites! hi,when adding canned chickpeas do i drain the liquid from it or as is? Hi Brenda! Chickpeas are drained! Add them after 10 minutes of cooking time! Thanks for the recipe, will make again for sure! Hi Marubi! Thanks so much for making it and for your fantastic feedback! I made it all the time! One of my favorites! Even better the second day. Thank you for this. I’ve never been so excited to share a recipe with my friends! Hi Xyz! Thanks so much for your amazing feedback and making it! That makes me really happy! This soup was easy to make and was OUTSTANDING. Hi Honey! That makes me really happy! Thanks so much for your fantastic feedback and sharing! Just made this soup for the first time and it was delicious! I used fat free yougurt instead of the coconut milk and added a skake of chilli powder and a shake of cayenne pepper to add a bit more heat! Thank you for the recipe, i shall look at your other recipes now! Hi Judith! Thanks so much for your amazing feedback and making it. Really hope you find lots of more recipes to try! Sorry I forgot to rate it! Served this for my boyfriend’s family and everyone loved it. I didn’t add any of the additional ingredients, but it still had so much taste and it was wonderful. I did however serve it with rice, which made it even better (imo). Thanks so much for fantastic feedback, Sandra! Glad it was such a big hit! I made it all the time, one of my favorites! Hi! How do the lentils cook so quickly? Do you presoak them? Hi Tara! No presoaking! 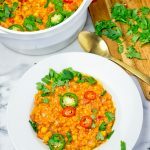 I used red lentils that cook really quick, but it might take a bit longer depending on the brand! Hi Natalie! I’ve never tried that before so I can’t say for sure. Let me know how it goes if you try! So excited about your experiences! I just can’t with this meal!! It’s so good. Thank you for the wonderful recipe! Amazing!!! Do you know if it freezes well? Hi Chrissy! I haven’t tried it before, but I would guess why not. Let me know how it goes!